Enjoy television viewing like never before with this 108-cm (43) Full HD LED TV from Mi. Apart from featuring 1 GB of RAM and 8 GB of storage space, this TV also comes with cinematic sound quality, a rich range of colours, and multiple connectivity options. Also, with PatchWall and Google Voice Search, navigating and finding content to watch is simple and convenient. Enjoy watching your favourite movies and TV shows in stunning picture quality, thanks to its 1080p Full HD screen and the powerful 7th generation picture quality engine. 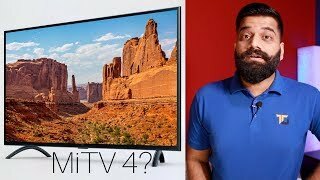 This Mi TV ships with Patchwall with Android TV. With Patchwall you get access to over 700,000+ hours of content from 14 content partners. You also get deep integration with Set Top Box, so you can search and watch all your favourite content with a single remote. Patchwall with Android TV brings the best of both worlds. With Android TV, you get access to Chromecast, Google Voice Search, Google Play store & YouTube. While PatchWall curates and recommends content for you, Universal Search helps you find the content you wish to see. Also, the One Remote and the One Interface model enhances your STB and SmartTV experience. You’ll not miss out even on the subtlest of sounds, thanks to the two powerful 20 W (2x10W) stereo speakers featured in this TV. Powered by a 64-bit Quad-core processor and 1 GB of RAM, this Mi TV lets you experience a lag-free and seamless performance. With the 8GB onboard storage, you can install all your favourite apps from Google Play store. You have a wide range of connectivity options available with this Mi TV – there are 3 HDMI (1 ARC), 3 USB, Bluetooth 4.2, Dual Band WiFi, S/PDIF (Coax), 3.5mm Out, AV & Antenna to cater to all your connectivity requirement.